Transfer learning is when you take model that has been trained for one problem and then retrofit it for another problem. Imagine you have a model with a deep CNN architecture trained to classify images. The last layer of you architecture is a softmax to convert scores to a confidence distribution. The scores are typically a 4096D feature vector (Fig 1) describing the image. The theory is that if you have a good model that generalises the images well, then you can piggy back off that and train a model for a very specific use case. We can visually prove the generalisation power of a deep CNN arch, by using a dimensionality reduction technique, like t-sne, on a 2D scatter plot. To continue the example of Women’s Clothing presented in Figure 1 & 2, if we pass our training set of Women’s Clothing images through the pre-trained Deep CNN we can collect all the outputs as a new training set. 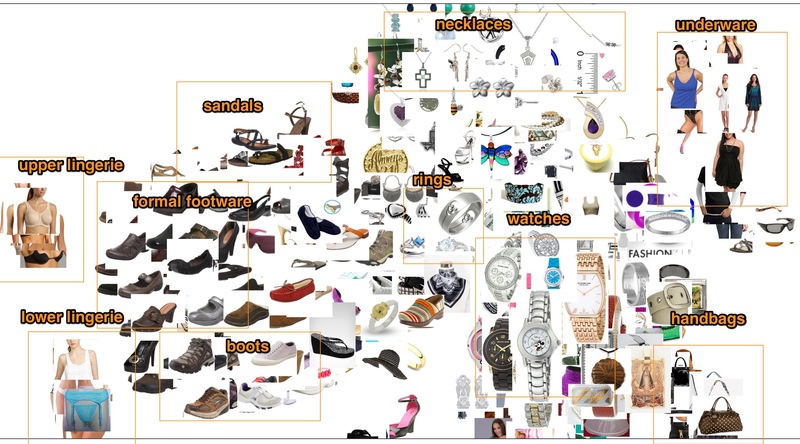 Now we can use our new dataset to train a simple classifier to predict the Women’s Clothing class labels. For example, ImageNet does not include any of these Women’s Clothing labels we’re training on here. However, the kinds of information that make it possible for ImageNet to differentiate among 1,000 classes are also useful for distinguishing other objects. By using this pre-trained network, we are using that information as input to the final classification layer that distinguishes our clothing classes. They then show how feature vectors from the second to last layer of Deep CNN architectures trained on ImageNet can be used as input to a new classifier trained on different class labels. This has two advantages: allows you to skip training a classifier from scratch and allows you to leverage powerful pre-trained models. ​Figure 3: Figure c & d, from the DeCAF paper shows the clustering of ImageNet categories in 2 dimensions, where c is features from the first pooling layer and d is from the penultimate layer. Clearly defined clusters in d, shows how the first layers learn low-level features, whereas the latter layers learn semantic or more high-level features. They then go on to describe the flexibility of the transfer method and how the base model doesn’t need much in relation to the new training data. For example, DeCAF preformed well on scene recognition (SUN397) even thought original arch. was not trained on a related dataset (ImageNet) which shows the generalisation power. In figure 4, evaluation results of two different types of models trained on Caltech-101 images w/ feature vectors extracted from 3 different parts of the CNN arch are presetned. 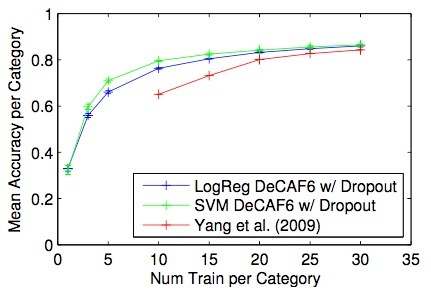 The SVM and logistic regression trained from the penultimate layer of the deep CNN preformed on par w/ each other. Figure 5: Necessary examples per class to get inference results. See Transfer Learning models can start w/ only 1 example per class. Surprisingly, fine-tuning a net that was originally trained for object recognition reported higher accuracy in visual sentiment prediction than a CNN that was specifically trained for that task. One explaintion for this possibly suggests the importance of high-level representations such as visual semantics gained from Transfer Learning approaches of models trained on ImageNet. On the other hand it could represent the importance of a high amount of convolutioal layers which  doesn’t explore.